Alex Anmahian of AW Architects gave a presentation of the plans for the new Hart Perry Boathouse by the Mystic River. Photo: John Thornell. 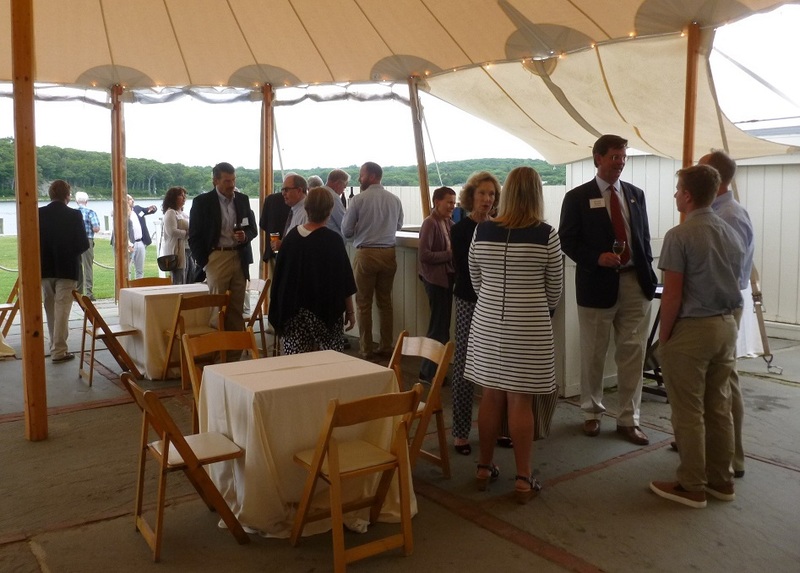 Rowing enthusiasts got together to listen to the development of the Stonington Community Rowing Center and Hart Perry Boathouse in Mystic/Stonington, Göran R Buckhorn reports. As HTBS reported in May, the Friends of Stonington Crew (FOSC) Boathouse Committee selected Anmahian Winton (AW) Architects of Cambridge, Massachusetts, to design the Hart Perry Boathouse at the Stonington Community Rowing Center (SCRC), which will be located in the Mystic River Boathouse Park on Greenmanville Avenue in Mystic, Connecticut. What O’Neill is referring to is that AW designed the Harry Parker Boathouse for Community Rowing, Inc. (CRI), in Boston, a 30,000-square-foot facility, which opened in the autumn of 2008. AW was the recipient of the American Institute of Architects (AIA) Institute Honor Awards for Architecture in 2014 for the Harry Parker Boathouse. 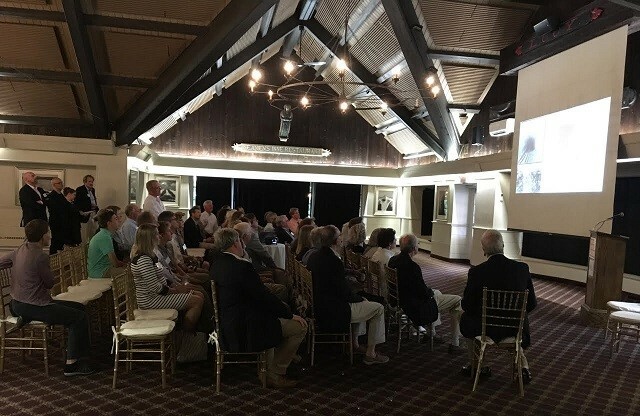 Last Wednesday, around 65 rowing enthusiasts and supporters of Stonington Community Rowing Center had accepted an invitation from the Friends of Stonington Crew to come to listen to a briefing on the project at Latitude 41° Restaurant in Mystic. Around 65 people gathered outside in the beautiful Wednesday evening for drinks before being briefed about the Mystic River Boathouse Park. Photo: Göran R Buckhorn. Amongst the gathered people, HTBS spotted several local rowing dignitaries and members of the Stonington Community Rowing Center Leadership team, including Honorary Chairperson Gillian Perry Millsom, Dana Hewson, Mike O’Neill, Heidi Simmons, Dale Hoxie, John Thornell, Campaign Manager Rick Larkin and Campaign Coordinator Carrie Hebert Moore. In the group was also Rob Simmons, first selectman of Stonington, Steve White, president of Mystic Seaport Museum, and Rick Rinehart, one of Hart Perry’s oarsmen from Kent School and author of Men of Kent. 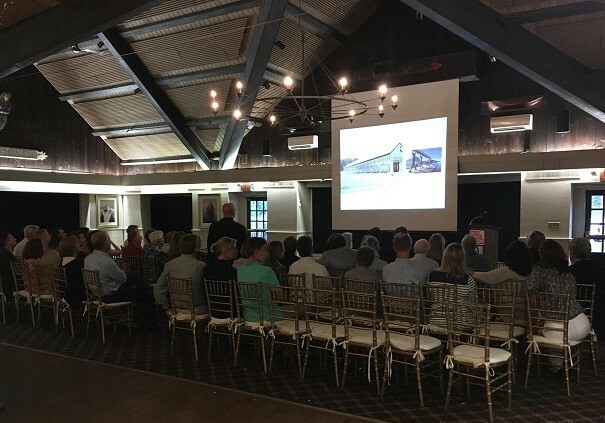 Chad Frost of Kent + Frost landscape architect and Alex Anmahian of AW Architects provided updates on the Mystic Boathouse Park and Hart Perry Boathouse projects. Frost and Anmahian have been working closely together since AW got involved in the project about a month ago. Chad Frost gave a captivating talk about how the rowing center property, which is going to be turned into the Mystic River Boathouse Park on Greenmanville Avenue, was created by the owners of the Rossi velvet mill across the street from the park. The old mill building is now owned by Mystic Seaport Museum and used as the museum’s Collections Research Center. In the rear of the building is the museum’s Watercraft Hall. The park design and the boathouse architecture will honour the fact that, without the mill, there would be no park. Anmahian talked about using visual themes from the sport of rowing in the design. He also referenced the Harry Parker Boathouse as an example of simplicity, elegance and functionality. Furthermore, the boathouse and park will create a gateway to the town of Mystic on Greenmanville Avenue, as the park will open the views of the Mystic River for travellers coming from Interstate 95. 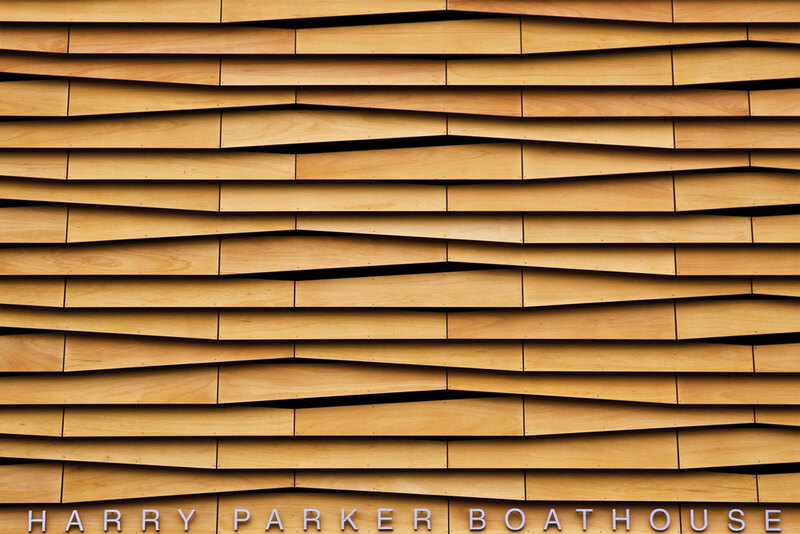 Harry Parker Boathouse, detail of the facade. Photo: Anmahian Winton (AW) Architects. Park designs will facilitate the process already underway of nature reclaiming the land, using spartina and oyster castles. The Town of Stonington, which includes the part of Mystic east of the river, is currently reviewing park plans. Kent + Frost will soon host a charrette to gather public feedback on the park project. There was a lot of excitement for the project with the park, rowing center and boathouse among the attendees. Several of them mentioned that they expect a high demand for membership. Anmahian mentioned how the membership grew at the Harry Parker Boathouse for Community Rowing in Boston once the center was completed. The Harry Parker Boathouse has now around 300 people in the morning and 1,200 people per day passing through its doors. Without a doubt, the Stonington Community Rowing Center (SCRC) and Hart Perry Boathouse will have a profound impact on the town of Stonington and its neighboring communities. 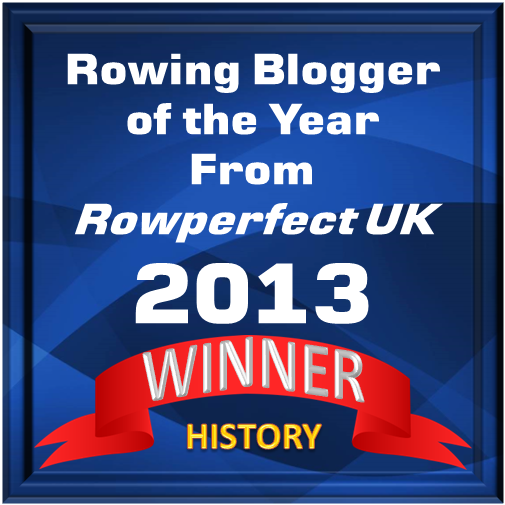 […] For 10 years, I witnessed the incredibly positive effect rowing has had on thousands of individuals in the communities we serve. Smith then mentions seven benefits with a community rowing center – read his article here. To rowers, rowers’ parents and families, coaches and others already involved in the rowing community, Smith is not presenting any revolutionary ideas, but they are worth repeating again and again, especially to non-rowing children, youths, adults, educators, politicians (both on local and national levels) and people working in health and social services – putting people on the water will make our communities stronger. To find more information about the Stonington Community Rowing Center and the Hart Perry Boathouse, and to donate money to the campaign, please go here. A special ‘thank you’ to John Thornell for providing material to this article.